I am not alone in this feeling as it is shared by most anglers I know. Drive by a few landings after the lakes open up and you will see just how many anglers like the idea of getting back in the boat. There is more to the story than enjoying the feeling of open water, however. These early season anglers are not just joy riding, they are searching out some fishing action, as well. Generally, this means crappie and bluegill. Most springs I make frequent trips to area lakes in search of panfish. Even though these fishing trips take place on many different bodies of water, the fishing locations on each lake share some very strong similarities. The fact that I fish similar structure on different lakes is no accident. Instead, it is a matter of following the habits of the panfish. Once anglers understand the habitat panfish are looking for in the spring, finding and catching fish becomes a lot easier. After ice out, spring crappie become very interested in eating. This is due to the fact they spawn when the water temperature reaches the low to mid sixties. Female crappie, in particular, need extra energy to help the development of their eggs. In addition to that, spawning takes a lot of energy for both sexes. 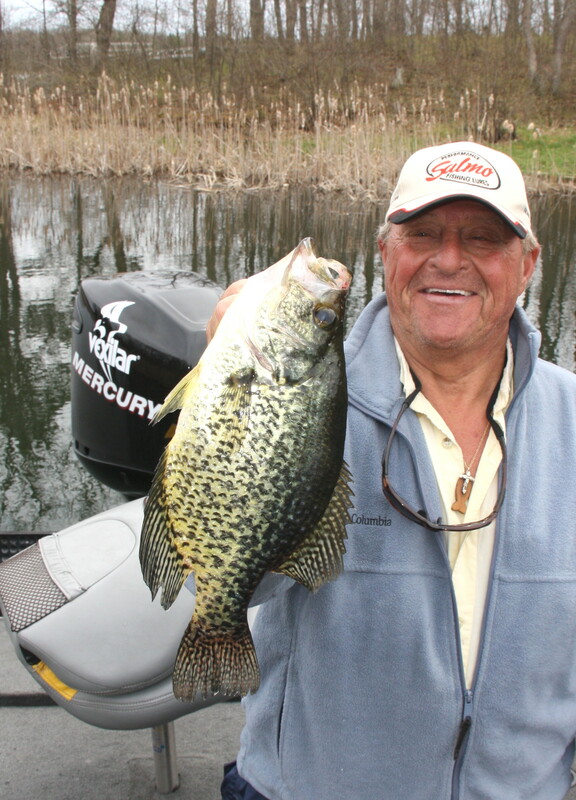 Water temperature is one of the keys to finding early season panfish. These fish are looking for places where the insect larvae are active. It is the protein found in the larvae the fish are looking for. Mud bottoms are also a part of the spring equation for two reasons. Insects live in the mud, and dark, mud bottomed areas absorb sunlight and warm faster than other locations. When I think about my favorite spring crappie hangouts, most of them have the same thing in common; they are somewhat disconnected from the main part of the lake. This is a huge consideration when picking a place to fish and here is why. Shallow bays that are connected to the main lake by a narrow channel are going to warm much quicker. The protection provided by the necked down entrance is ideal for creating a mini environment for fish. On the flip side of things, when the cold wind blows and fronts come through, these areas will cool off just as fast as they warmed up. Like fishing any place else, timing can be extremely important. 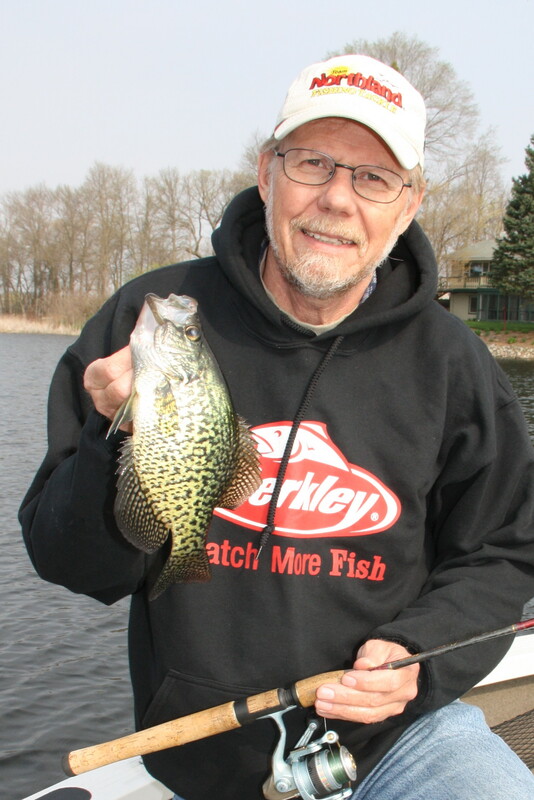 Bays and channels that are somewhat disconnected from the main lake warm quickly and create ideal early season panfish habitat. Sometimes I believe the fish will actually move out of these sheltered bays during spells of bad weather. Other times, they may stay in the bays but become inactive until the sun comes back and warms the water up. There are other considerations when fishing these bays that anglers need to think about. First of all, these shallow water fish are quite spooky. Light line, such as four or six-pound-test Berkley Trilene or five-pound-test Northland Bionic are good choices. I also like long rods that allow me to cast far from the boat. Spooky fish are very much afraid of boats so keep your noise to a minimum. This concept alone can make or break a day. As for lures, I rarely use minnows at this time of the year. I love 1/64 ounce pink and white Fire-Fly jigs. I usually fish them plain but sometimes a little PowerBait will help, especially if you are targeting bluegill. Early spring is a great time of the year to be on the water. It can also be a great time of year to catch those early panfish. Disconnected bays that warm quickly will usually produce plenty of action.